Not too long ago, I shared with you that I was a #ShareYourCare Ambassadors and was sharing with you all about the Care Bears Share Your Care Day activities. The Care Bears helped spread love and kindness all over the nation and encouraged people everywhere to #ShareYourCare! In keeping up with this fun Care Bears initiative, I will be giving away two copies of the latest Care Bears DVD release. Care Bears: Mystery in Care-A-Lot was just released in time for Halloween. Join the Care Bears for a Halloween-themed adventure filled with friendship and good cheer. The Bears show the power of caring and sharing as they transform bad dreams into sweet ones, solve the mystery of the legendary Scare Bear, and save Care-a-Lot from turning into Grump-a-Lot in this delightful collection that kids and their families will love! 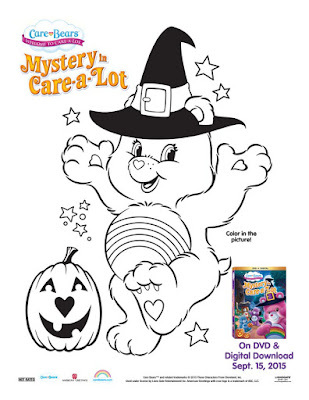 Order Care Bears: Mystery in Care-A-Lot [DVD + Digital] at Amazon for $9.96 & FREE Shipping on orders over $35. The Care Bears: Mystery in Care-a-Lot is made up of three, 22-minute episodes: Nightbears, Sleuth of Bears, and Welcome to Grump-a-Lot. This DVD is perfect to get kids in the mood for Halloween without frightening them! This DVD is sweet, safe and fun for the little ones. Not only do you get the DVD, but also an ultraviolet code to be able to watch this movie on any app enabled device, so your little ones can enjoy this movie on the iPad, Kindle, etc. as well! Each episodes teaches kids how to overcome fears, deal with bad dreams, how to be positive and how to be a good friend! In Nightbears, the crew have to help Sweet Dreams bear get her good dreams back. Sleuth Bears have the bears try and solve the mystery of the a legendary scary Bear. In Welcome to Grump-a-Lot, Grumpy accidentally spreads his negativity making Care-a-Lot into Grump-a-Lot. Now he has to fix it and get everything back to its cheery old self! Stay Connected with all things Care Bear and #SHAREYOURCARE!